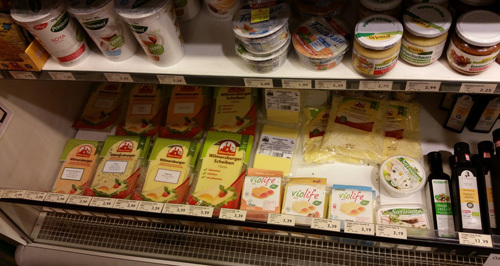 How awesome is Düsseldorf for vegans?! Seriously! 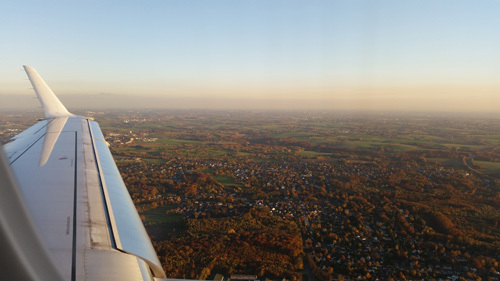 A couple of weeks ago I flew to Düsseldorf for a boring work meeting. Since it was a Friday I decided to stay on and fly the husband over for the weekend. 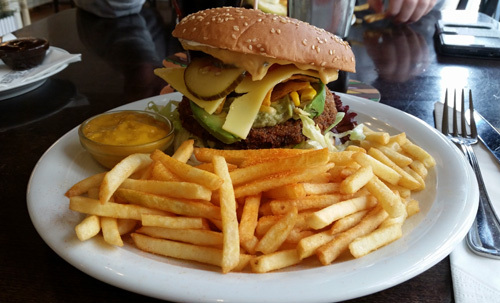 Originally I had wanted to move onto Berlin, as it has recently been named the “vegetarian capital of the world”, but the flights were expensive so we decided to stay put. At first I was a little dubious. I mean Düsseldorf is beautiful and there is loads of amazing buildings and plenty to do… but it was hard to ignore all of the places selling fur, bratwursts and veal. Not to mention the millions of buttery looking bakeries. Husband didn’t arrive in Düsseldorf until late on the Friday night, so we stayed at the Maritim hotel which is right next door to the airport. And what an amazing hotel it was! The room was lovely but even better was the choice of 5 restaurants and various bars downstairs. 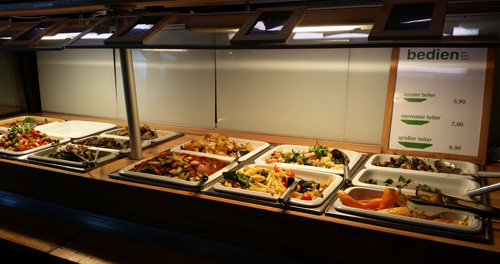 The Maritim hotel website boasts about its vegan and vegetarian options (even the magazine in the room mentioned vegans) but unfortunately the Düsseldorf Airport branch doesn’t have many choices available. However the staff were very accommodating and went to a lot of trouble to make sure I was well fed. 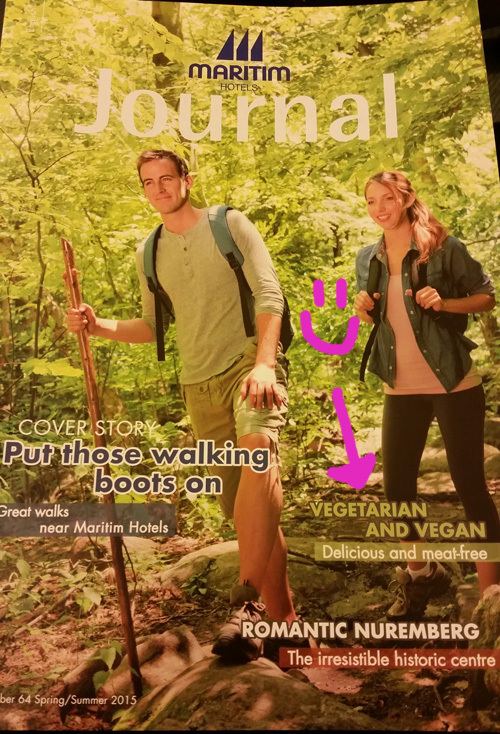 Vegans get a mention on the front cover of the Maritim hotel magazine! 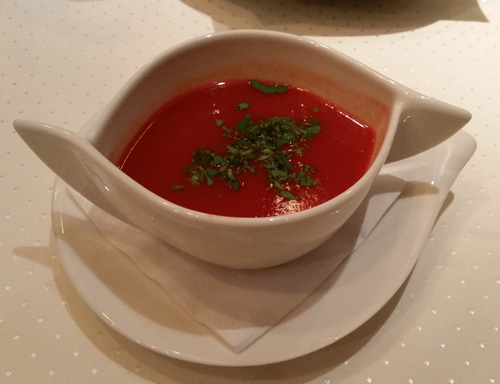 We picked the Bistro “Bottaccio” restaurant as it seemed to have the most adaptable menu. 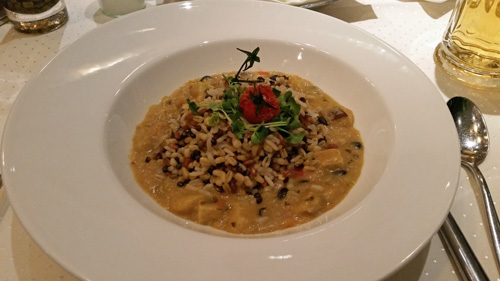 After negotiating with the waitress I had a blood red tomato soup (served with bread and plenty of olive oil) followed by a very nice tofu Thai green curry with wild rice. We were too full for dessert so we headed for the bar and had a few cheeky gin martinis instead, lovely! Overall it was a bit on the pricey side, but we accepted that we were a captive audience and just enjoyed the experience. 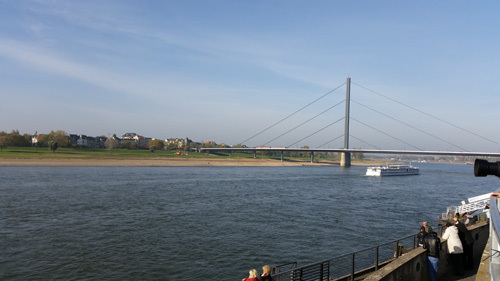 On the Saturday we skipped breakfast, jumped on the train and headed straight into Düsseldorf itself. After dumping our stuff at the hotel, we wandered around the shops and ended up at an amazing buffet style restaurant called Sattgrün. 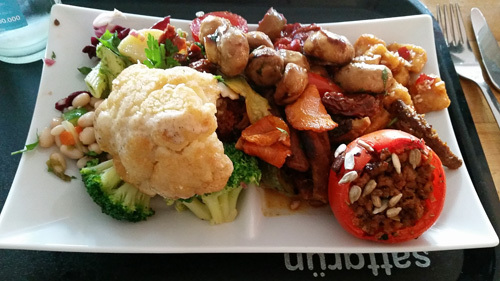 Husband was very reserved and just had a bowl of sweet potato and coconut soup (which was absolutely divine) whereas I went for the buffet and LOADED my plate full of seitan, tofu and vegetable dishes ♥ Every single thing I ate was so delicious that it brought a wee tear of happiness to my eyes. I REALLY wish we had a place like this at home. 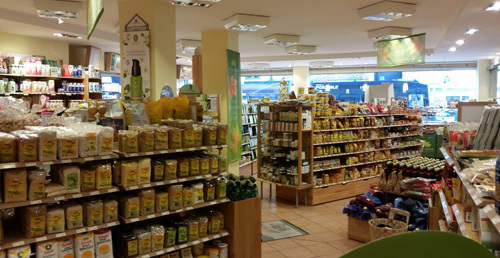 There are quite a few health shops in Düsseldorf. I visited two – Bio Park and Vita Nova. 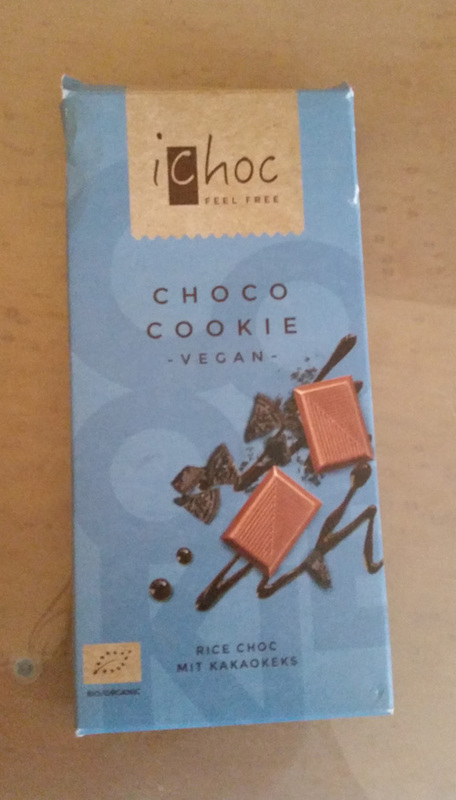 In Bio Park I just bought some crisps and an iChoc, Choco Cookie bar (which to be honest I can get at home). 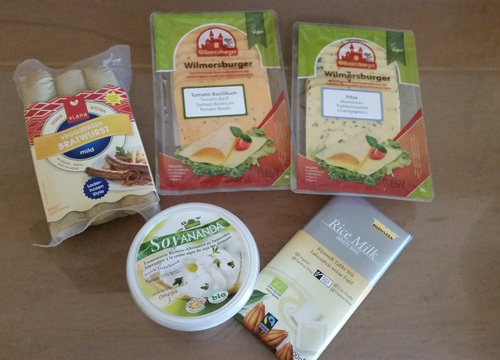 In Vita Nova I could have spent a million pounds but unfortunately I’d only brought a small suitcase… I got a white chocolate bar which to be honest was disgusting, but I also tried some cheeses I’ve never had before and some veggie bratwurst which were AMAZING. Also I had the best vegan sour cream I have ever tried – it was super realistic. 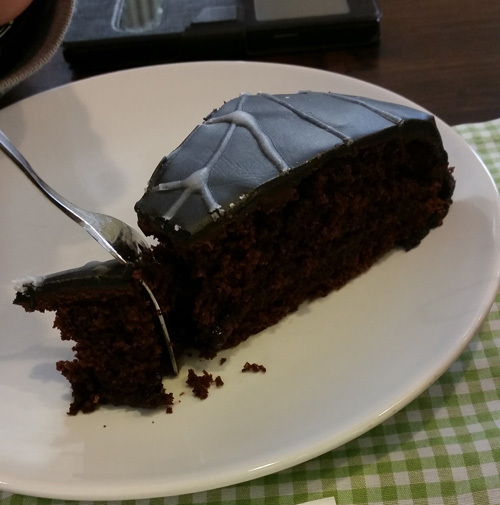 All that shopping tired us out so we visited a gorgeous little coffee shop called Carrot Cake. 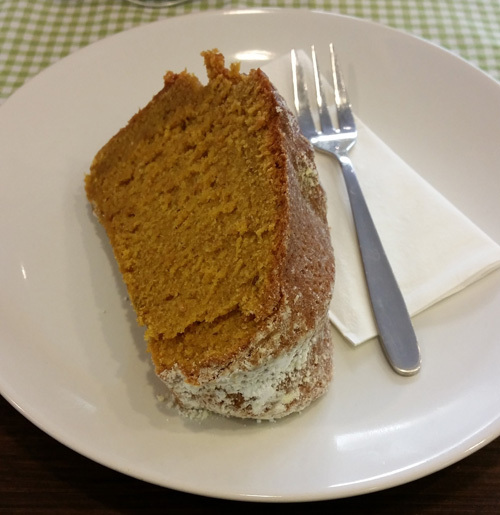 I had a whacking great slice of stodgy pumpkin cake and Husband had a Halloween chocolate cake (with a red raspberry filling). 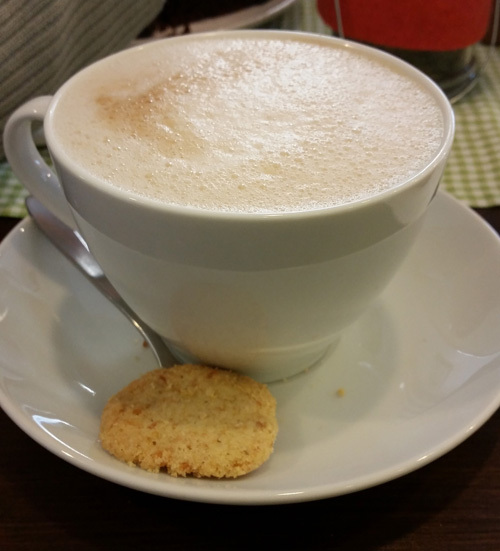 We both had a latte which came with a cute little biscuit. Everything was to die for and in my opinion, ridiculously cheap! No wonder the place was full. In the evening, despite the fact we weren’t particularly hungry, we paid a visit to a place called “What’s Beef”. 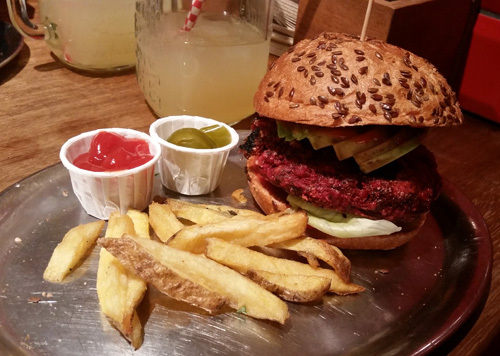 I know this doesn’t sound particularly vegan friendly, and perhaps it isn’t the best choice for the more sensitive vegan… BUT they do a veggie beet burger on a vegan bread bun with tomato, lettuce, cucumber, onion and homemade tomato sauce and it was gorgeous!!! Especially since I asked for extra avocado on top. Win. 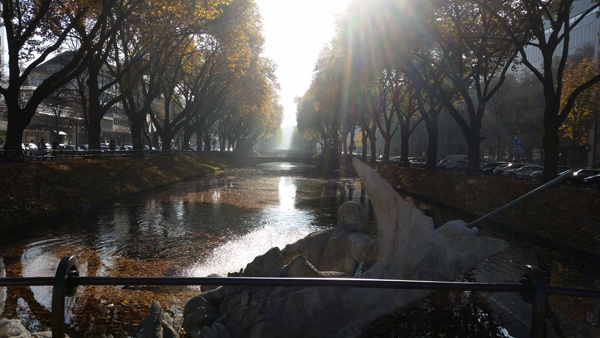 On the Sunday we again skipped breakfast and enjoyed a lovely autumnal walk around the “posh” part of Düsseldorf. We were surprised to find that most of the shops were shut but luckily the weather was good so we enjoyed the fresh air and picturesque views. We cut through a shopping centre where the corridors were being used as a catwalk for some fur-clad models *vomit*. I managed to get myself punched in the face by one of said models – which Husband found hil-ar-ious! Again, in the evening we were far from hungry but we couldn’t resist trying out What’s Beef’s sister company, “What’s Pizza”. 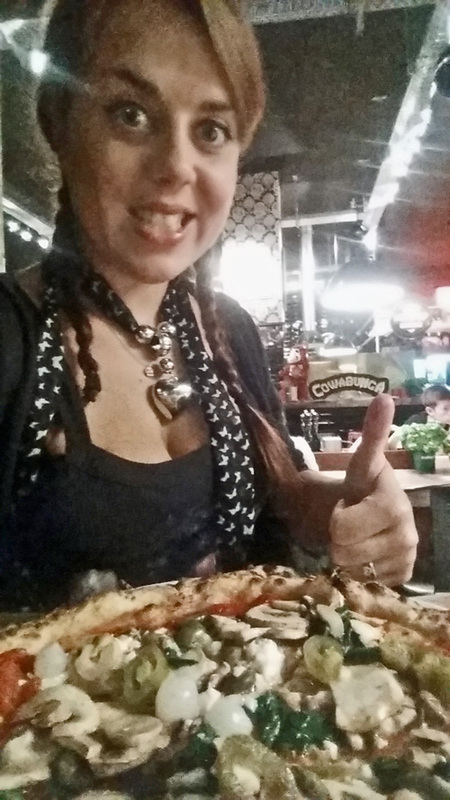 This place does a “meatless Monday” but what really caught my attention was the option to have “vegan mozzarella” on my pizza! Unfortunately the mozzarella just turned out to be silken tofu, but it still worked really well with my mushroom, spinach, olive and chilli combo. 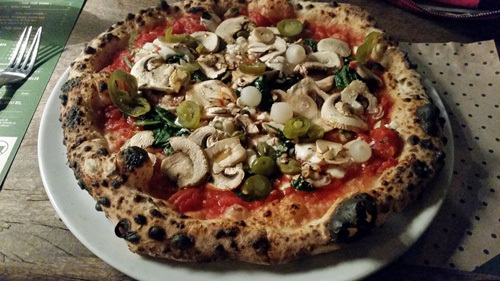 The pizza bases were lovely as well – it was a joy to eat my crusts. It was very fortunate that we ate so much during our stay because on the Monday we headed straight to the airport where our flight ended up being delayed. Luckily our newly acquired fat reserves kept us going for the journey back, ha! 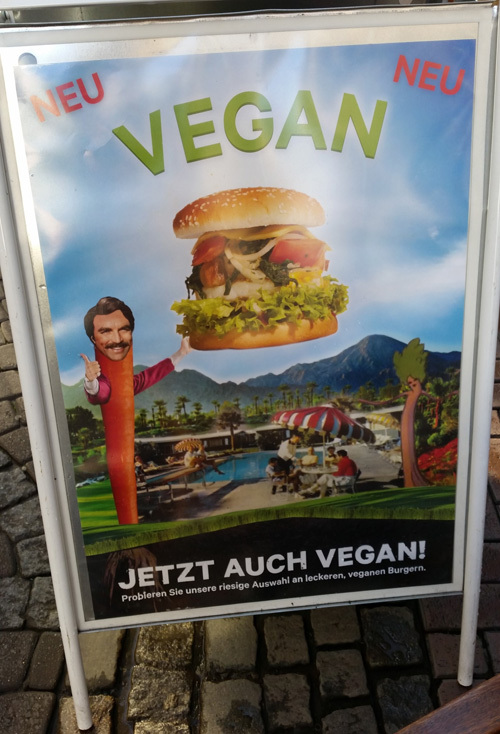 So, if Düsseldorf is this amazingly fantastic for vegans, I really really really can’t wait to pay Berlin a visit!